Most of us can relate to these lyrics for a simple reason, and that is we all come from a family. Whether we are close or not we love them because they are family. We justify their actions. We don’t always agree with them, but we love them . We give after we swore to never give again and we hurt when they hurt. I only have two younger brothers and there is nothing I would not do for them. When my daughter cries big brother Phopho runs and starts saying ncese (Zulu for sorry) Thando, and if he thinks you are hurting her he will defend her. He is only 2 years old, but he is already very protective of his sister. No one teaches you how to love your sibling, you just do. Even when they do things you are not proud of, that does not stop you from loving them. Unlike romantic love, you do not get the option to leave this relationship. You were born into the relationship/s and you are stuck with them for life. When we come into the kingdom of God we become joint heirs with Christ, we share a father 😊isn’t that just amazing ? So whenever you get into trouble your brother Jesus pleads with the father to help you (Romans 8:34). There are things which I have done to protect my brothers, even when they were wrong. That’s what makes me practically understand grace, you can’t help but give them another chance and another one and another one. It is unmerited favor. You would even go as far as blame yourself for their mess. But the truth is everyone has their own lives to live, and we cannot live on behalf of our families. Each one of us has their own mistakes to make and learn from. My brother was involved in a car accident, just like any first born I wanted to scream and shout at him for being reckless. But my gratitude to God for preserving his life drove me to tears. And I realised that he still had a plan for his life despite his mistakes and bad judgement. I started thinking about the wrong decisions that I have made and still making, which God has already forgiven me for. He is my father and there is nothing I can do to separate myself from his love. Despite all my flaws. It would have been so easy for God to strip us of choice. Don’t you sometimes wish God would just say those who make bad decision must just lose the right to make decisions ? But our God is a gentleman, he want us to choose him, he wants us to make a decision to love him . Not out of fear. I have a cousin and an uncle who are drug addicts, every time I see them my heart sinks and I wish can stop myself from caring. But it is impossible. They are not only destroying their own lives but hurting the people around them. You can’t help but wonder, how can people born in the same family receiving from the same love and provision can turn out so differently. Every time I get mad at them I am reminded that I would not be able to pray with or for someone going through the same thing, because I simply would not be able to relate. All members of the family form part of essential ingredients that make you who you are. Some think only for themselves, and take without giving , while others give without asking for anything in return. Both are necessary. 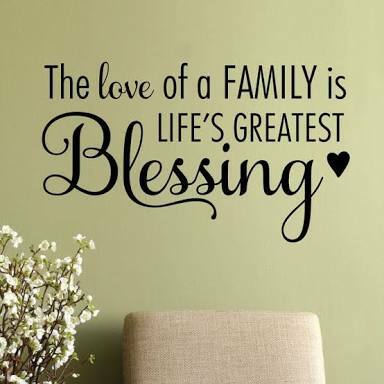 Because the world can be a harsh place, God gave us family a place where you will always belong, not because you have earned it but because it is your birth right. Their love for you should provoke you to make better choices, because you don’t want to hurt or dissapoint them . I’m sure you can see where I am going with this, It is the love of God that provokes us into becoming better versions of ourselves, not the fear of of punishment hence grace trumps law every time. Rest in the knowledge that you are joint heir with Christ and he would do anything to protect you. The same Christ who advocates for you does the same for your family members and he will not give up on them. We may get tired but he never does, he will see to finish the good work he has started.Ours is to pray and trust him. In the mean time he is teaching us how to love unconditionally. And giving us the opportunity to give freely that which we also received freely(GRACE). Previous Post: Are you who they say you are? Next Post: Are we a product of of our Environment or our Choices? Amen and amen ! I sooooo can relate ! You can’t choose your family. You can only pray for them and accept them for who they are. Especially the part about how you don’t have an option to leave when hurt or disappointed. You continue to give, to forgive and to love and care even when you’ve been brutally disappointed. You also receive all of the love in return. That’s the beauty of grace ! I love this Pru ! Such a beautiful piece. Amazingly enough I was talking to a friend of mine about the love and attachment that I have for my family. You’ve just reinstated my sentiments 🙂 . I enjoyed it; looking forward to the next one.